If you like making infused oils, you can use the oils to create all natural flavors for your lip balms. Pictured is a small collection I made to test a few ideas - all with handcrafted flavors. 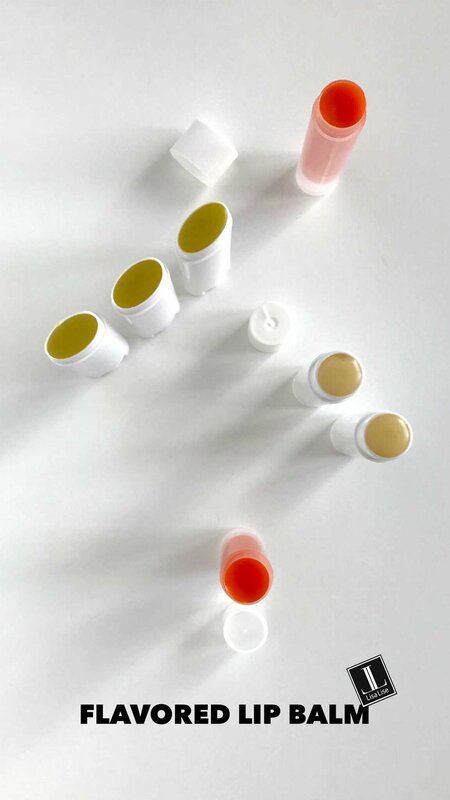 The light colored balms include vanilla-infused oil and a dash of plum oil for extra richness. The green balms are a mix of pepper and mint (see what I did there?) for a surprisingly spicy-fresh flavor, and the bright orange balms have both their color and flavor from the chili-infused oil that delivers a warming after-burn. Learn how to make vanilla-infused oil on the main blog. There’s also a chili-infused oil how to on the main blog as well. Do you have any favorite herbs you use to create flavors for your lip balms? If you have been following me and my work for a while, you are probably already aware of my love of minimalism. My approach to almost every formula is to pare back as far as possible without sacrificing function. Sometimes it takes more effort than one might imagine to create the perfect ‘less-is-more’ formula, but that’s what makes it such interesting work. Above is an example of a very ‘quiet’ and simple cleanser that does an effective job without causing a fuss. Developed for sensitive skin, tested, and approved. When I tested this lip balm with my own handcrafted chili-infused oil for the first time, I expected to feel like my lips were on fire, but there was no immediate heat. Instead, it crept up quite slowly and increased in strength until there was no question in my mind: this lip balm was destined to be named Afterburn. This lip balm is 100% plant-based - even the color - which is the result of a combination of oils infused with Turkish Paprika and Chili Peppers. Are you signed up for my newsletter? Cool, cuz then you can look forward to an adaptable balm formula with chili-infused oil. Want to sign up? Excellent! Visit this page to join the upcoming chili-balm fun! The inherent power and benefits of botanicals never ceases to amaze me. If one were inclined to dismiss the science of it all, one might be tempted to call it herbal magic. Pictured: rooibos ready to become part of an infusion that will become part of a skincare product for a special person with sensitive skin and a love of all things botanical. That description fits all of my clients come to think of it. The glass wand is a handcrafted stirring rod from a talented glass artist in the UK. Coffee beans can quickly become a great addition to an exfoliating scrub by simply grinding the roasted (unused) beans and adding them to your body scrub. Pair the grounds with salt, sugar or another dissolving exfoliating ingredient to keep staining at a minimum. Pictured here: a paste of coffee grounds and sweet almond oil. This is the remains of an infusion I made to make a decadently scented coffee and brown sugar exfoliating body scrub as an extra little gift for a steady client. Do you formulate with food? What are your favorite ingredients? Here’s a fun little demonstration of how a change in pH can make a difference to certain ingredients. A handcrafted blueberry glycerite was added to a surfactant and the pH change was instantly evident in that the color changed from a bright pink to a blue-grey. Those little pink spots are the glycerite before the surfactant was added to the mix. The blueberries were added to demonstrate the natural color of blueberries.